It is rather amazing how so many Biblical prophecies are coming to pass right before our eyes. Though it used to scare me when I would see some of these things happen, it no longer does. I am convinced that my Savior’s love for me will be sufficient to see me through the coming days. Not just me but all of His kids. I don’t fixate on prophecy but I do believe we are to “be wise as serpents and gentle as doves” with all that is going on. (Matthew 10:16) Throughout history, God has warned His people of coming events and that is true today. So as we see more and more Biblical prophecies fulfilled how are we to respond? I believe the most important thing we can do is stay close to Jesus. As we lean on Him, He will guide us and direct our paths. We do not need to fear anything or anyone. We serve the living God who has promised to not give us more than we can bare and we can take Him at His word! He has promised He will never leave us or forsake us. He has promised that NOTHING can separate us from His love. If we are not convinced of His love for us, we have reason to fear. There is a lot of very dark things happening right now and this will only increase. However, when we come to understand just how very much He loves us, we can start each day resting in that love. As we rest in His love, we are able to be His hands and feet to others and share the good news with them. If we are not convinced of His love for us how can we possibly reach out to others with the love and peace of Christ? If you are not yet convinced that God loves you, than it’s time to start familiarizing yourself with some truth from the Bible. He, who sent His precious Son to suffer and die in order that your relationship with Him may be restored, loves you! Let’s take a look at just a few examples of His words to YOU…. John 3:16 NIV 16 For God so loved the world that He gave His only begotten Son, that whoever believes in Him should not perish but have everlasting life. 1John 3:16 NIV 16 By this we know love, because He laid down His life for us. And we also ought to lay down our lives for the brethren. Romans 5:18 NIV 18 Therefore, as through one man’s offense judgment came to all men, resulting in condemnation, even so through one Man’s righteous act the free gift came to all men, resulting in justification of life. 1John 4:9 NIV 9 In this the love of God was manifested toward us, that God has sent His only begotten Son into the world, that we might live through Him. 1John 3:1 NIV 3 Behold what manner of love the Father has bestowed on us, that we should be called children of God! Therefore the world does not know us, because it did not know Him. Romans 8:38-39 NIV 38 For I am persuaded that neither death nor life, nor angels nor principalities nor powers, nor things present nor things to come, 39 nor height nor depth, nor any other created thing, shall be able to separate us from the love of God which is in Christ Jesus our Lord. 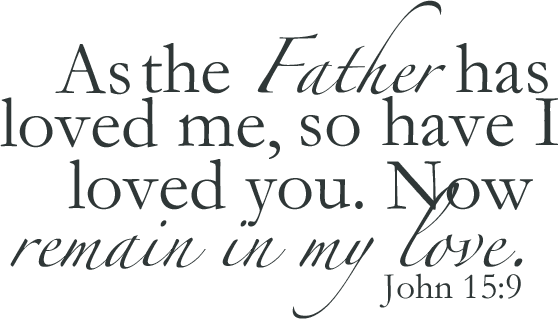 And finally Jesus’s words to us in John 15:9 NIV 9 “As the Father loved Me, I also have loved you; abide in My love. These words are for each and every one of us, not just a select few! As worldwide troubles increase, do not fear. Trust in the One who was willing to die for you. Know that He will not allow anything to separate you from His love. Abide in His love and allow that love to flow through you into a world that desperately needs to learn of Him. I always enjoy your posts! This is one of my favorite verses. God bless! Thank you! It’s one of my favorites too!